When you’ve got a beautiful hardwood floor, you want to keep it that way. These cleaning tips and advice on the best hardwood floor cleaning products will help. That beautiful hardwood floor will stay looking beautiful for an entire lifetime if you treat it well. But if you treat it poorly, it will disappoint. So, it’s essential that you clean it properly, and this includes using the best hardwood floor cleaning products in your cleaning regime. This will help ensure you get value for money from your hardwood floor. 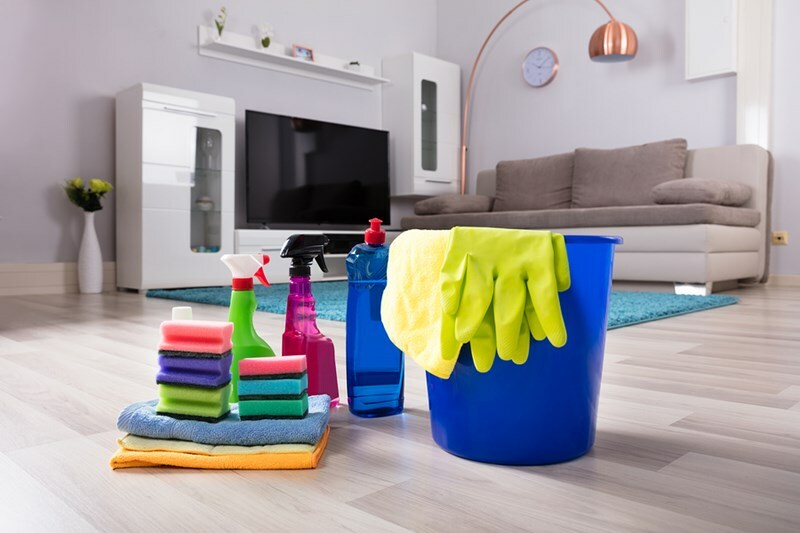 In this article, you’ll learn our top cleaning tips to help you keep your hardwood floor in top condition – including a few of the best hardwood floor cleaning products that can be bought in your local hardware store. Dust gathers quickly on a hardwood floor. If you have kids or pets, you’re likely to get a lot of dirt brought in from the outside, too. Sweeping with a soft brush each day will help to prevent scratches caused by dirt, grit and dust being ground in when your floor is walked on. At entry doors into the house, place a doormat and encourage people to use it to wipe off any dirt from their shoes and dry footwear when it’s wet outside. If you accidently spill something on your hardwood floor (water, wine, juice, etc. ), wipe it up immediately. If you leave liquid sitting on a hardwood floor, it could cause irreparable damage. Even after wiping on a doormat, footwear could damage a wooden floor. Grit, glass and other debris embed in the soles of shoes and this can damage floors. Don’t use furniture polish. It will leave a residue, which is not only slippery and dangerous, but also may leave unsightly streaks. Do clean weekly, to ensure that your hardwood floor benefits from a regular ‘deep clean’. Don’t use a steam mop, as the steam will penetrate the wood and cause it to warp. Don’t use abrasive cleaning products as these will scratch the hardwood floor. Don’t use any cleaning products that are either acidic or contain ammonia. These are likely to strip the protective layer from the wood and cause permanent discoloration. What are the best cleaning products for your hardwood floor? Bona Hardwood Floor Cleaner is a favorite among hardwood floor owners, and a trusted household name. It’s a water-based cleaner, designed for spray and wipe use. Used correctly, it won’t leave streaks and is kid and pet friendly, too. Orange Glo Hardwood Floor Everyday Cleaner will leave your home smelling citrus fresh. Spray and mop for streak-free cleaning. Babyganics is a good choice for those with crawling babies and toddlers who spend a lot of time on the floor. A completely natural floor cleaning solution, though it shouldn’t be used on unsealed floors. Add to water and mop, but make sure you follow the manufacturer’s guidelines – too much product can leave a sticky residue. Pledge FloorCare is a squirt and mop solution, and ideal for larger floor surfaces. The Mannington Award Series Cleaner is great for hardwood floors when dirt has built up. Simply add 2 to 3 cups of the Award Series Cleaner to a gallon of warm water and mop. No rinsing is necessary, though a quick rinse will help to keep the highest shine. Mannington Award Series Polish is the product to use to reinvigorate a hardwood floor that has lost its luster. For hardwood floors that have received heavy use and suffered from neglect, Mannington Award Series Heavy Duty Cleaner and Stripper is the cleaning product to use (a simple clean, rinse, dry process) before applying Mannington Award Series Polish. For help choosing the best hardwood floor cleaning products for your floor and the use its receives, contact Porter's today.